Bright pink bougainvillea and prickly pear cactus in Kula. This is one of those quirky juxtapositions that I love about Maui. All sorts of plants grow, often side by side, that seem like an odd combination. I associate bougainvillea with tropical or subtropical climates... and with lush green landscapes... and the prickly pear cactus with the dry, sandy desert. But Kula is dry enough to be like a desert, warm enough for both plants to grow, and quite cool at night. So, Arizona meet Hawaii. There are actually an amazing number of prickly pears that grow on Maui, both in Kula and in the dry south shore along Makena. By the way, bougainvillea also is plentiful in Makena and Wailea, but I've never seen it growing next to a cactus! It's just not a favored plant combination for hotel landscapers. More bougainvillea, white and red, next to more cactus. These pictures were taken along Kula Highway, the makai side, or the side towards the ocean, going uphill, a mile or two before Kula Hardware. I made the mistake once of trying to examine a prickly pear fruit on the ground in Kula. No gloves. It was dumb and my hand tingled uncomfortably with teeny prickles. If you are tempted to gather prickly pear fruit, bring a good pair of gloves. 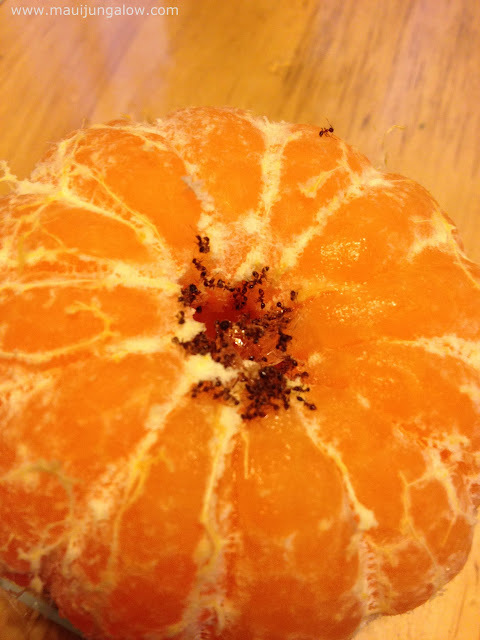 I've heard that one can roll the fruit on the ground to remove the prickles or roll them around in a bucket of sand. One thing both plants have in common is thorns. So maybe they are not such an odd couple after all! The last mock orange blossoms for the season. Everything is transient. Even though Maui weather is still mostly sunny, we are entering the season when even dryer upcountry areas like Pukalani and Haliimaile are visited by more rain showers. The mock orange started blooming profusely about two weeks ago. The intoxicating and heady scent of small fragrant flowers drifted around the mock orange trees and shrubs and even filled the air inside the car as I drove by. Every time I passed the mock orange trees at the old Baldwin Estate on Haiku Road, I thought, "Oh, I need to stop and take a picture of the white flowers falling on the road." They were picturesque, like drifts of snow covering the ground on a winter day. Well, I didn't take the picture soon enough, and about a week ago, the peak blossom season had ended. Instead of a picture with masses of white flowers lining the roadway, I have a picture of mostly withered flowers. Mock orange season was short, poignant, and fleeting, like a Japanese haiku. flurries of once white and fragrant mock orange flowers lining the road. By the way, here's a random piece of Maui trivia. The town of Haiku, Maui, which properly should be spelled Ha'iku with the Hawaiian " 'okina" or glottal stop/apostrophe, does not refer to the Japanese style of poetry called haiku. Japanese haiku are short poems, often about nature, that are 3 lines long. The first line is 5 syllables, the second line is 7 syllables, and the third line is 5 syllables. The trivia part is that the phone prefix for Ha'iku on Maui is also "5 7 5." Whoever set up the phone prefixes for Maui had a sense of humor. I blinked and missed them. Well, I do have pictures of mock orange berries. Flowers last week, berries this week. P.S. Pau means "it's over." This haiku is more expressive if you can mimic a local accent for the last line. Ha'iku, according to my Hawaiian dictionary, is the name of the Kahili flower, Grevillea banksii. I've also learned something for the day. Warning: Greg does like to use a particular four letter word during his talk. Hint: It begins with the letter S and ends in T. Greg also explains why he uses this word. If you are easily offended by swear words, then please don't watch this video. Greg was the last speaker at the Maui Farmer's Union Meeting on 11/22/11 in Pukalani. This is a free and public meeting, held the last Tuesday each month. For more info, www.mauifarmersunionunited.weebly.com. Greg is a bit unorthodox in his approach to worm composting. He wants to show how easy and cheap it is to create one's own homemade worm composting bucket system. He also explains why he uses food items that are often considered "no-no's" for composting, like dairy, meat, and animal products. I wasn't present at this talk on Wednesday at the UH Maui Campus, Occupy Wall Street Maui General Assembly. But the people I've talked to said that they were impressed by Marianne Williamson. She will also be speaking at the Studio Maui on Friday (today) and Saturday. Maybe she's preaching to the choir, but it's still rousing. Another friend took some audio clips and we're trying to figure how to post them. Astronomer Harriet Witt usually speaks at the Maui Farmer's Union public meetings each month. This month, she talked about the astronomical significance of birthdays, since there were at least two special attendees with birthdays. Note, this is astronomical, not astrological... Meaning what birthdays represent in space/time. She also talked about "giving thanks" from her scientific perspective. Last month she gave a great presentation about the Hawaiian New Year, which is the first new moon after November 17th. Click here to view: Harriet Witt's Makahiki Presentation. Courtney to egg: "Are you in there?" Visions of hard boiled eggs cooked in a compost pile have been haunting me for the last week or so. At recent gardening classes at Hali'imaile Community Garden that YES, I learned it is possible to hard boil an egg in a compost pile. If one gets the compost pile hot enough, using the right combination of nitrogen and carbon, one can hard boil an egg in an hour. About a week ago, a fellow gardener was making compost. As we finished talking, he said that the compost would get really hot on Friday and I could try the egg experiment. 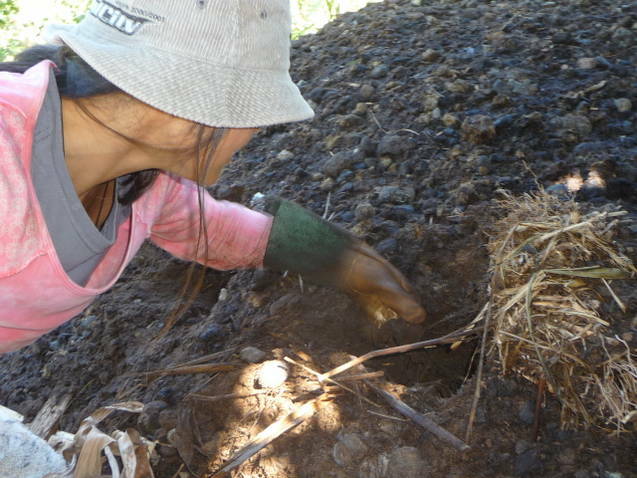 He suggested putting the egg in a hole towards the center of the compost, about 3/4 of the way up from the ground. He emphasized that I should wear a glove when putting the egg in, because it can get really hot. I wasn't sure I could get there on Friday, and he said it should be hot on Saturday too. Ok! The experiment was on. Armed with a big glove, a raw egg straight from the refrigerator, and a video camera, I headed for the compost pile on a Saturday morning. My husband shaked his head with disbelief as I left the house. Ah, yes... well, technology can be imperfect... as imperfect as human error! All night Saturday, I was thinking, ah, if only I had taken a couple of photos too... Instead, the evidence was gone. The egg was mighty good eating, all warm from the heat. All I had left was the aluminum foil with the heat marks. There was a hard boiled egg in here, but I ate it. The aluminum has heat marks. I was elated, thinking about how the compost pile could be used as an alternative cooking method, like special stoves at Aprovecho and passive straw bed cooking. My mind developed scenarios about how people would cook food at the end of the world, making huge cooking compost piles and letting them heat up. Sunday morning came, and I woke up early, without an alarm clock. It was 6:30 am, and I couldn't sleep. Hmmm.... I pondered the pros and cons of going to the garden and repeating the egg experiement, this time getting footage of the opened egg, versus doing some housework. Playing around with raw eggs and the compost pile or dusting and sweeping and tidying up? If I didn't go on Sunday, it would wait till Wednesday or who knows when? Well, I was a pushover and the garden won. This time, I brought two raw eggs in case I screwed up with the first one, and a small, raw sweet potato. I did learn from last time. I ended up digging three separate holes and putting each item inside. This proved trickier than the day before, since the holes kept collapsing on my glove, and I ran into a couple of branches or twigs. But I managed to get them inside. Click on this link if the video doesn't show below. About an hour or so later, Lehuahana Vander Velde showed up at the garden. I told her about my egg experiments and invited her to participate. Operating a video camera with one hand and dealing with eggs and manure with the other hand is quite tricky, so four hands are better than two. We discovered that, "Hey do you want to check out the compost pile?" would be a great pick-up line for single gardeners. In the next video, Lehua is filming as I dig out the first egg. Click on this link if the video doesn't show below. We did find the second egg, on the other side of the compost pile, but the camera wasn't on. I saw it, and as I tried to pry it out between some branches in the compost, saw it go splat into the compost. One egg down. The outside was hard, but the yolk was most definitely soft. I dug out the sweet potato from the center hole and it was definitely softer and cooked on the outside, but still raw. The sweet potato, slightly cooked but still hard inside. Maybe the egg hadn't cooked that well because it was not as close to the center. The hole that I had used yesterday had worked pretty well. So after finding the first egg - finally, I shook it and it felt a little wobbly in the center, so I moved it to the center compost hole. Photo courtesy of Lehuahana Vandervelde. 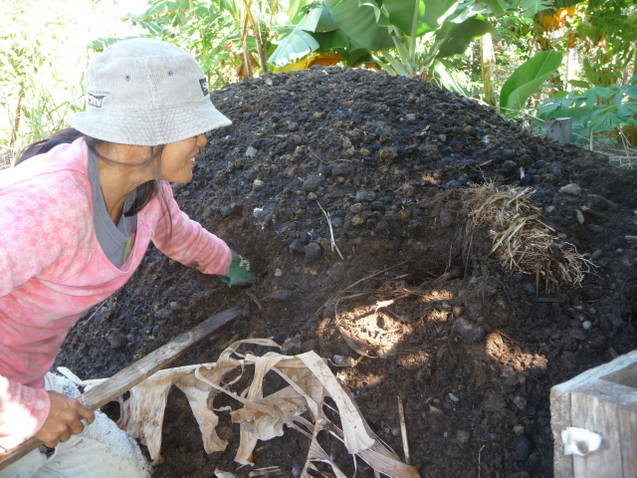 Lehua speculated that the compost pile had reached its hottest temperature on Friday or Saturday and had started cooling by Sunday. WHAAT?? You mean, compost piles don't stay hot all the time? No, she said, "They definitely have a heat cycle and then cool down." So using compost piles is not the most efficient way of cooking food, even if there's an extended power outage. So much for my Mayan calendar 2012 compost pile cooking scenarios. Nothing like playing with horse manure and raw eggs on a Sunday morning. 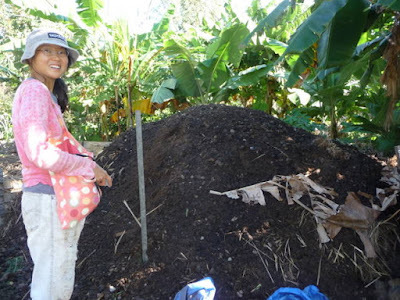 At that point, I needed to go, and left the video camera and the manure glove in Lehua's hands. "Your mission if you choose to accept it, is to film the egg while opening it." So is it possible to hard boil an egg in a compost pile? Yes, my first egg cooked in 1 1/2 hours, but I don't have any photos or videos of it after it cooked. That's why I went back to the garden the next morning. Of the two eggs that I used the next day, one was partially cooked and got damaged when I tried to remove it after 1 1/2 hours and the other egg was relocated to a hotter hole. It was soft-boiled after about 3 hours. 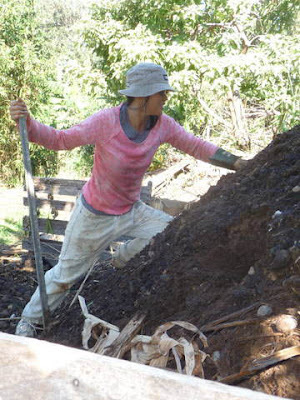 It's an experiment worth repeating, when the compost pile is hot enough. It's also easier when more people can help! Many thanks to Lehua for volunteering!